The evening of Saturday-Sunday 20-21 February saw a very dynamic weather situation. Fields of clouds came and went very rapidly: the sky could go from clear to clouded to clear to clouded again in a matter of minutes. 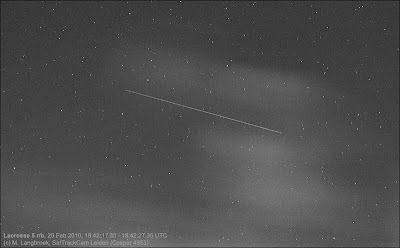 It made it a big gamble whether a particular object would eb visible or not. As it came to be, I hauled a nice batch of positions on several objects: Lacrosse 5 (05-016A), the Lacrosse 5 r/b (05-016B), the STSS Demo 2 (09-052B) and the NOSS 3-2 (03-054A & C) duo. 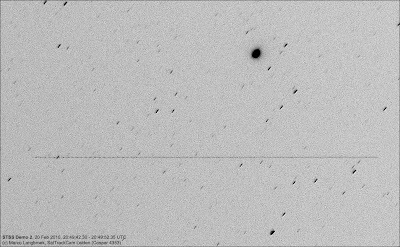 I also photographed the NOSS 3-4 duo but the image was too much hampered by cliuds tp reliably measure it. 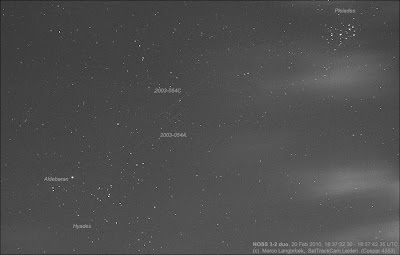 I lost amongst others Lacrosse 4 and the STSS Demo 1 to clouds (the latter a pitty, as it was predicted to pass right through the Pleiades). Below is the brightness profile over the trail (grey small crossmarks are individual pixel values, the solid line is a 3 point average), and below that is a graph of the time between brightness maxima visible in the profile. Note in the second diagram how the time between maxima is very constant, at about 0.13 seconds, during roughly the first 2 seconds . After that, it begins to wildly vary. 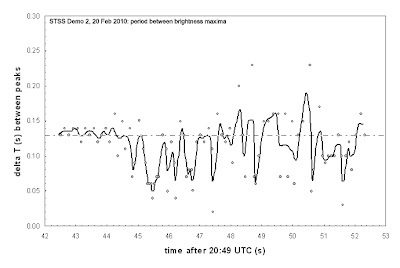 As the first diagram shows, the amplitude of the brightness variations is larger in those first 2 seconds too. In fact, after those first two seconds the variation is largely or completely random pixel variation. The first 2 seconds of the trail are quite different in character from the rest of the trail though: a clear constant, larger amplitude pulsing behaviour. This is very interesting. 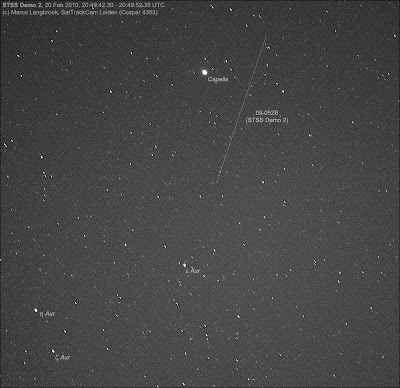 A second image obtained on the STSS Demo 2 during the same pass showed a quite constant brightness.